Trouble keeping up with your fitness goals; don’t break your new year’s resolution just after one month in. Here are some great tips to help your keep your routine while working out in the comfort of your apartment. These workouts are great, they’re simple, don’t require heavy equipment and won’t disturb your neighbours. It’s important to find quiet workouts when you live in an apartment and wish to exercise at home. Some apartment buildings are older, and noise may travel easier so you may have a couple of your neighbours complain if you’re jumping around and shaking the floorboards. You don’t want to upset your neighbor, may lead to uncomfortable situations or letters from your landlord requesting you monitor the noise. Fortunately, it’s easy to stay in shape while keeping the peace with a few simple tips. Jumping exercises give you a great cardio burn, but they can also be noisy. Save the jumping for another location and choose exercises that are low-impact instead. Focus on weight training while in your apartment, as these exercises only require movement that has at least one foot on the ground. Try exercises like squats, curls, crunches, mount climbers, planks and more. Search the web for exercises that work each muscle group or buy workout videos that offer exercises that require as little movement as possible. Resistance band exercises utilize force to give you a workout. The idea is to incorporate a rubber band into certain moves, which resists your pull motions. You can add the band to exercises that use weights, or create a new move. You can try this exercise, work the muscles in your back as well as your biceps by using a resistance band to do rows. Place one foot forward, on top of the center of the band. Pick up an end with each hand and then row. The band should be tight enough that you have to use your strength to pull. If you ever want up the intensity, simply tighten the band by wrapping it around your hands a few times. Yoga and Pilates use poses and stretches to build strength and increase flexibility. Because you settle into a stance and then hold it, you aren’t jumping around or creating much noise. You can find or design a series of poses that create an entire sequence. Try to develop these series to target certain areas. 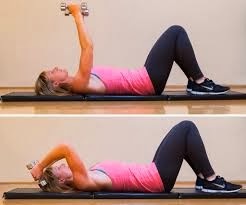 For example, one sequence may work the triceps, shoulders and core while another could focus on quads, biceps and back. Do each series three times and then move on to another. You should always end a session with a set of poses that are meant to stretch your worked muscles, slow your heart rate and relax your body. Control Your Movements: No matter what exercise routine you use, you can be quieter by controlling your movements. Focus on how you move your body rather than simply moving. Furthermore, maintaining control will help prevent injury, and keep your muscles working harder. Absorb Impact: Perform your exercises on a yoga mat to absorb the impact caused by your movement, the rubber mat will stick the ground and not move as you exercise. This will help prevent loud strikes and thumps from traveling downstairs to your neighbor’s apartment.